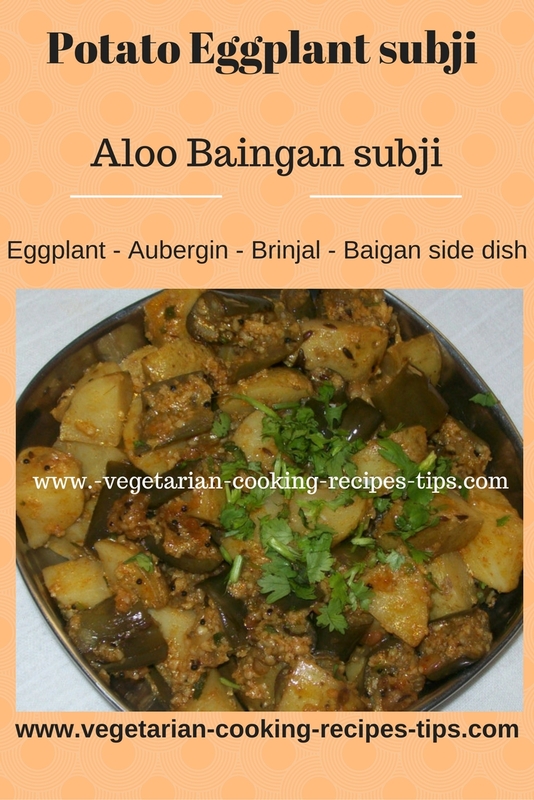 This Potato eggplant aloo baingan subji recipe is a easy and fast vegetable side dish. There are many eggplant recipes that can be served as side dishes but this is one of the easiest. Eggplant is also known as aubergine, brinjal. You can serve it with chapati, paratha, naan or plain rice. It is best served hot but tastes good at room temperature too. Subji will keep in the fridge for 3 days. Just reheat before serving. It is a good one to take for lunch to office or in your kid's school lunch box with chapati or rice. The ingredients for this aloo baingan subji are few and it gets ready in about 15 minutes. You may adjust the quantity of eggplant and potatoe according to your liking. This is a dryish subji. You may visit Eggplant Potato curry for a Maharashtrian style curry with gravy. Fresh Coriander (cilantro) leaves - 1 tbsp chopped. Sugar or jaggery(brown sugar) - 1/2 tsp or according to taste. 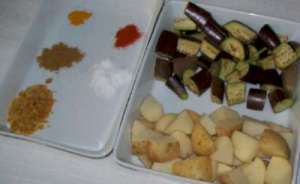 Cut brinjals and potatoes in pieces and keep in two bowls of water separately. Heat a pan and add vegetable oil of your choice. When it is hot, add mustard seeds and cumin seeds. Let them crackle. Add hing(asafetida) and turmeric powder. Add potato pieces. Stir, cover and let cook for 2 minutes. Add eggplant pieces and mix well. Sprinkle a little water (about one tablespoon) cover and cook for 2 minutes. Add the chili powder, garam masala, jiggery or sugar and salt. Mix well. If it looks too dry, add 1 spoon of water. Check if potato and brinjal are cooked. Cook some more if necessary.Do not let brinjal get too soft. Add coriander leaves and fresh grated coconut if adding. Mix well. Cover and let rest for five minutes. Serve hot with chapati, paratha, naan or with plain rice. I usually keep proportion of eggplant and potato 50-50. But it can be changed according to your choice. You may reduce the quantity of brinjal or potato. Many times I add less brinjal than potato. I have not removed the potato skins. You may remove the potato skins if you wish with a peeler. If you have boiled potatoes ready, you may use them and the cooking time will be reduced further. Along with or instead of garam masala, you may add cumin powder (Jeera powder) and coriander powder (dhania powder). Add more water if you like. If you are using boiled potatoes, add cut eggplants in the pan first. When they are cooked, add boiled and cut potatoes and all the other spices etc. Roasting eggplant on the stove top - To make baigan bharta.